X-Lite is a proprietary freeware VoIP soft phone that uses the Session Initiation Protocol (SIP). X-Lite is developed by CounterPath Corporation, a Vancouver based software company. Version 4.0 was released in September 2010. X-Lite complements other non-free products offered by the company, like Bria, Bria iPad, eyeBeam, mobile gateways and SIP based developer tools. X-Lite is available for Windows and Mac and can be used to make audio/video calls and to send Instant Messages to a softphone, mobile or landline telephone number. X-Lite has some outstanding features. A comprehensive user guide is provided. I use X-Lite with a SIP account from my Internet provider Visual-Online in Luxembourg. Screen recorders to capture video, sound and pictures of anything you see on your screen can also been used to record Skype video calls, but this is very CPU intensive. I use the registered version of Evaer to capture skype video calls and to save them as mp4 videos in side by side format. The current Evaer version is 1.3.11.22, released on November 12, 2013. If one of the Skype callers use an iPad or similar device, it’s best to set the tablet in landscape mode with the Home Button turned left, to assure that the user is displayed as expected in the video. In September 2010, Skype launched the version 5.0.0.123 beta release and the stable version 4.2.0.187 for Windows. Version 5 comes with a free trial of group video calling, allowing to call up to four friends. After the beta test, this feature became paying. At least one person on the call needs now Skype Premium or a group video subscription from Skype Manager to use group video call (monthly subscription). Skype offers free Skype-to-Skype voice and video calls and free instant messaging. Calls to public fixed and mobile phones, Short Messages (SMS), voicemails and other value-added services are billed by Skype. Several payment options are available. Skype is available for Windows, Mac OS X, Linux, mobile phones and some Television sets. Skype offers an excellent support with user guides, troubleshooting guides, FAQ‘s, forums, knowledgebase, different blogs (Big Blog, Community blogs, Technology blog, Business Blog, International Blogs, Heartbeat) and a development site (Skype Garage). A new software development kit (SkypeKit) that enables hardware and software makers to add Skype functionality to their devices and applications is available to a limited number of beta program developers. A public Skype API enables third-party applications to communicate with Skype. A hardware and software certification (skype certified) is provided by Skype. The audio codec preferred for Skype-to-Skype calls is SILK (Super Wideband Audio Codec). Skype has contributed the SILK source code to the Internet Engineering Task Force working group. For Business Skype offers Skype Connect and Skype Manager. Skype pays a special attention to sound and video quality. A funny third-party application for Skype is Crazytalk. Skype was founded in 2003. It’s based in Luxembourg, with offices in Europe, the US and Asia. It’s owned by an investor group led by Silver Lake and which includes eBay Inc, Joltid Limited and Skype founders Niklas Zennström and Janus Friis, the Canada Pension Plan Investment Board and Andreessen Horowitz. I updated my Skype version to 5.5.0.119 in october 2011. Mozilla is a global community of people creating a better Internet. As a wholly owned subsidiary of Mozilla, Mozilla Messaging organizes the development and marketing of email and messaging products encouraging choice, innovation, and opportunity in messaging on the Internet. Thunderbird, as a messaging system, is uniquely positioned as the tool that users can use to integrate as many of their communications as they want. By combining an open architecture, a powerful extensibility and customization framework, and a person-centric perspective on communications, Thunderbird is a powerful yet enjoyable tool to help individuals manage their online interactions, whether that’s email, instant messaging, social networking messages, or other types of message. Today, I installed version 3.1 of Thunderbird on my PC running Vista. The profiles are saved to C:/Users/username/AppData/Roaming/Thunderbird/..
To import the messages from my Windows Mail Client, I installed the ImportExportTools from Kosmos Website. This is done with the menu Tools >> AddOns in the Thunderbird Client. I added a folder “WindowsMail” under “Local Folders” with three subfolders Inbox, SentItems and DeletedItems. After installing the ImportExportTools, a new Menu Import/Export appears when right clicking on a folder tab. All .eml files in the Windows Mail Folder are imported, even with the option of including subfolders. Finally I installed the freeware MozBackUp 1.4.10 to MozBackup, a simple utility for creating backups of Mozilla Firefox, Mozilla Thunderbird, Mozilla Sunbird, Flock, SeaMonkey, Mozilla Suite, Spicebird, Songbird and Netscape profiles. It allows you to backup and restore bookmarks, mail, contacts, history, extensions, passwords, cache etc. I configured the Thunderbird Client to use IMAP (Internet Message Access Protocol ) for incoming messages. The current version, IMAP 4 revision 1 (IMAP4rev1), is defined by RFC 3501. IMAP supports both on-line and off-line modes of operation. 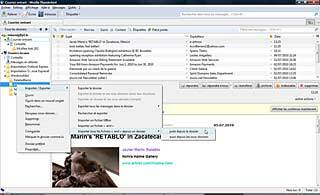 E-mail clients using IMAP generally leave messages on the server until the user explicitly deletes them. This and other characteristics of IMAP operation allow multiple clients to manage the same mailbox. The +883 country code used for iNums is still in the process of being deployed globally across the existing PSTN. As a result, users in some countries may not be able to dial an iNum directly on their existing PSTN carrier. To assist users whose carriers do not yet support the +883 country code, Voxbone, the carrier behind the iNum initiative, has set up local phone numbers in 45 countries. For Luxembourg, this number is +352 20880108. Simply dial this local access number and dial the chosen iNum afterwards. iNum is an initiative launched by Voxbone, supplier of local telephone numbers to communications services providers and businesses worldwide. Voxbone is a privately held company with offices in Brussels, Singapore and Los Angeles. An iNum will be automatically assigned to developers of a new application on the free VoiceXML VOXEO platform.